Last week I had the honour of addressing the Mull Community Council who are extremely concerned about a proposal by Transport Scotland/CMAL to carry out a major reconstruction of Craignure ferry terminal at the staggering cost of £78 million. This proposal was to enable berthing of a large £75 million Glen Sannox class ferry. A key concern is that the mainly single track Mull roads are not able to handle the sudden arrival of 130 cars in one go. 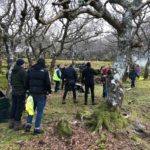 The proposal includes a huge reception building to hold 1,500 persons (over half the Mull population) which the community council believe to be both unnecessary and wholly out of scale with the rural setting in which it would be located. An alternative and more cost-effective proposition based on Scandinavian practice was discussed whereby a main vehicle ferry service would be provided by two 80 car, 400 passenger capacity double ended ferries, providing an hourly service in summer, with a single vessel giving a two hourly service in winter from 7am-8pm. This would enable year-round commuting between Mull and Oban, a facility that is not available at present. 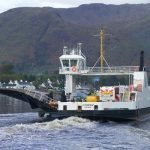 The vehicle ferry service would be supplemented in summer by a 250 passenger fast 35 knot catamaran to cover day trip foot-passenger peaks and could also connect Oban with Lochaline, Lismore and Tobermory. • 80 car, 400 passenger open water double-ended ferries for £3m to £7m depending on age, configuration, etc. It was noted that to enable safer berthing at Craignure, some extension of the existing structure would be required plus general maintenance at an estimated cost of some £10 million. Thus a more frequent, flexible and economical ferry service could be provided between Craignure and Oban for a capital cost of some £30-£35 million as compared with the circa £150 million scheme proposed by Transport Scotland/CMAL. The community council unanimously endorsed the alternative proposal outlined above. It was suggested that if large sums of money were available for misguided ferry terminal projects of the £78 million kind currently proposed by the powers that be for Mull and elsewhere, it would be better spent on more cost-effective ferry solutions, with the remainder earmarked for our struggling health and education services. I am shocked that primary school children are being seduced into these ‘strikes’. Primary schoolchildren should not be turned into political pawns for anyone’s pet project. If these children are so concerned about the environment they could be walking to school rather than using mum and dad’s taxi service, turning off their mobile phones, tablets etc, and picking up their rubbish. I am extremely tired of seeing sweet wrappers, pop cans, chewing gum, fast food wrappers, etc, strewn across the countryside. It is well enough documented that plastic is a hazard to wildlife, birds can get their heads stuck in pop cans, and some of the wrappers may, to a bird, resemble a delicious treat. Furthermore, discarded food waste can entice mice and rats. Climate protection starts at home with small steps. I have some sympathy with the views expressed by Victoria Sutherland concerning the needs of those who live in remote glens such as Glen Etive to derive some income for local projects from hydro developments such as those controversially granted permission in that beautiful glen. However, there are two issues which must concern us. Firstly; the three developments which are planned on the sites designated for protection due to their outstanding natural beauty and which have been specifically challenged by Councillor Andrew Baxter should not be permitted. What is the point of the creation of such ‘protected areas’ if they are not to be protected? Secondly, there is the vexed question of the community benefit payments which Mrs Sutherland correctly identifies as important to the community. My problem with these payments is that the Scottish Government in their wisdom, decided that rather than make them mandatory, they would be optional. It’s almost inconceivable that any commercial enterprise would adopt such a naive policy but our government somehow concluded that it would suffice for our communities. I have personal experience of the iniquity visited upon a small rural community by this policy. As a former secretary of Sunart Community Council, it was my job to pursue local estate owners for community benefit agreements when they had been given permission (usually with the support of the Community Council) for hydro schemes. With the support of Highland Council, I sent several requests to the owners of the three local estates (Conaglen, Carnoch and Laudale) and had a number of telephone conversations, but they all continued to insist that they were not obligated by law to offer any agreement. These negotiations were going on at the same time as the community council cycle was ending and I had already decided not to offer myself for re-election. 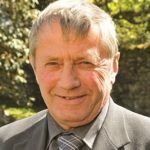 I advised the new council to pursue these estates in an attempt to get what most believed the community was entitled to, but sadly the new council failed to pursue the matter and the Sunart community have lost out on a considerable amount of money. My advice to Mrs Sutherland would be to get the Community Benefit Agreement signed upfront. I write in response to Victoria Sutherland’s recent letter. She writes eloquently of the many problems faced by small communities in the Highlands, which we do not doubt, and states that soon there will be no-one left, ‘if you deprive these remote areas of schemes that could provide the means to their survival’. What she fails to mention is that four schemes have already been approved for the Glen, which will provide more than enough energy and subsidy windfall for the area. It is a shame for the residents that they have been offered a pitiful 1 per cent of the expected revenue by the absentee landowner and developer, and I would respectfully suggest they take this up with them. There are other ways of bringing financial benefits to the region, such as fighting for National Park status. I worry that the more construction is allowed, and the more scars are left across open hillsides (as has happened all over the Highlands), the further away this aspiration will be.